A hundred - a hundred and fifty feet of boat with a hull in composite material. How are these large yachts made and how do you evaluate their features? Let's follow the building process step by step.. First comes the design: waterlines, inside structures and laminated surfaces. We can distinguish two main types; designs with a traditional style and those which exploit avant-garde technology, with an eye to performance. By preferring one to another you do not automatically choose a boat which is safer or more solid. If you look at the laminate, you will see that on traditional yachts this is generally monolithic or in a sandwich of balsa wood or PVC foam. The resin used is vinyl ester with MAT fibre with either biaxial glass fabric or a kevlar/glass hybrid. The avant-garde designs are more complex. 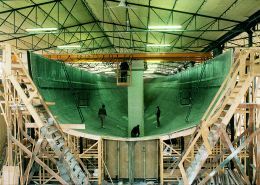 The hull is made completely in sandwich with honeycomb or foam core, preferably Nomex. Aluminium honeycomb is used little because it may be prone to corrosion in a marine environment. 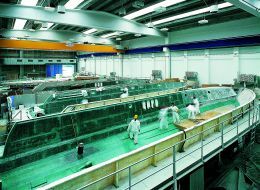 The various areas of the hull have different laminates according to the stress to which they will be exposed. The core is in foam in the bow area and in the quickwork and in honeycomb of a varied thickness elsewhere. The matrix of the composite is epoxy resin which has superior mechanical properties to vinyl ester and therefore can produce structures with a superior performance. Preference is given to elastic modulus fibres and kevlar is disappearing, making way for carbon which is more reliable and easier to work with. Unidirectional is preferred because it allows the fibres to be oriented and to stiffen the structure in the direction of stress. For example, to increase the flexural rigidity of the hull in a fore-aft direction the fabrics need to be positioned at 0°, or parallel to the longitudinal axis of the boat. Because of these complications, the designs are executed with finite element simulation software: the model of the yacht and its structures are constructed on special programmes which allow observation of the effects of the stress it will have to cope with in normal sailing conditions or following accidental events. Such a study allows the structures to be improved, reinforcing areas and lightening the rest of the structure. 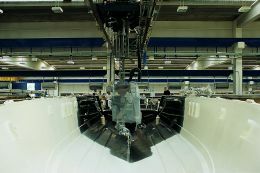 Mechanical properties being equal, then, a 'traditional' boat will be heavier than its twin made with avant-garde technology but that doesn't mean that it will be any less safe: it just means that the other has been optimised. From the design studio we move to the shipyard. The techniques currently used for building are manual impregnation of materials or the use of pre-impregnation. 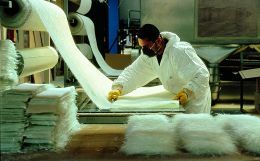 In the first case the dry fibres are laid out on the mould and then manually impregnated with resin (vinyl ester or epoxy) by an operator. Vacuum bagging is used to glue the core to the outer skin or in all laminating stages to make the layers more uniform and improve adhesion. This is a plastic film which covers and seals the laminate, removing the air trapped between film and fibre so that the materials are made more compact and the resin content more uniform as a result. In the case of pre-impregnate the fibres are bought by the shipyard already impregnated with epoxy resin and placed on the mould, and subsequently vacuum-bagged during the catalysis stage in the furnace. This technique gives a homogeneous laminate of a superior quality but can also cause various problems if it is not carried out with skill and care. First of all the pre-impregnate has a sell-by date if it is not preserved in cold storage. It's also very important to have an efficient furnace which can maintain a temperature of 80°C in a huge area (since it has to contain the hull of a 30 or 40 metre boat) for at least 8 hours. When epoxy resin is used a defective cycle will result in a low Tg (vitreous transition temperature), meaning the material will tend to soften if it is exposed to high temperatures such as those reached by a dark hull exposed to the sun. The temperatures reached by the hull in the furnace can cause serious problems to a honeycomb sandwich laminate. The air in the core cells can be trapped and expand as the temperature rises, causing the honeycomb to come away from the inside skin. Moreover, to ensure that the fibre layers adhere properly, the pre-impregnate must be protected from dust and damp so as to avoid de lamination problems in the future. For the same reason, vacuum-bagging must be carried out by skilled operators. Vinylester resin does not require as much equipment; nor do the operators need to be as skilled. The furnace is not necessary because once it has dried the resin achieves a high Tg value. Usually the building area is air-conditioned so that the temperature and humidity are maintained constant to guarantee the quality of the resin catalysis process. The weak points of vinyl ester resin compared with epoxy resin are the low mechanical properties and quicker ageing of the structure through osmosis. From an aesthetic point of view there may be bubbles on the outside surface if the core sticks badly to the outer skin. Problems connected to epoxy resin are generally caused by bad workmanship. Shipyards with decades of experience will by now have faced and solved these problems and they can produce boats which are just as reliable as yachts built in vinyl ester. From an economic point of view, a boat built using Nomex and epoxy resin sandwich will be much more expensive than a yacht of the same length and with the same design but built with a foam and vinyl ester resin core. If both are built with manual impregnating techniques there is a cost ratio of 7 to 1 which widens still further if pre- impregnate is used. This is without considering the greater costs incurred by increased labour and furnace time. At present the two technologies are brought together in the infusion technique with the use of carbon fibre. The reliability and simplicity of the infusion technique with vinyl ester is combined with the high mechanical quality of carbon. The final product is heavier than pre- impregnate but costs less. 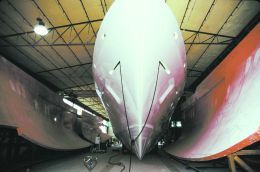 We will conclude this series of articles on the methods for building the so-called mega-yachts with this observation: while large sailing boats make abundant use of new technologies and new fabrics, so that all hulls feature at least one of the innovations described here, in motor boat-building progress towards technological innovation in the material sector has been much less and it is to be noted that all standard motor boats from 224 to 30 meters use technology which is at least 20 years old.